The Drilling Waste Management market report by Coherent Market Insights said that the increasing exploration and production (E&P) activities, growing concerns related to environment, and increasing awareness related to hazardous effects are some of the factors fueling growth of the market. Furthermore, ongoing activities regarding offshore drilling and improvements in shale gas explorations creates various growth opportunities for oil and gas manufacturers. Among service type, the treatment and disposal segment held a dominant position in 2016 and is expected to continue to lead the market over the forecast period. This is mainly owing to large scale penetration. Treatment and disposal service depends on characteristics of waste and regulatory requirements. Among application, the onshore segment accounted to held largest market share in 2016. Onshore application have a wider range of management operations as compared to offshore. These operations include underground injection, land application, biological remediation, and thermal treatment. Managing waste in an offshore application is more challenging and costly as compared to onshore application. This is due to stringent environmental regulations leading to offshore drilling operations, along with limited space available for operation. According to Oil Scams, the average cost of onshore drilling completion is $ 4.9 million to $8.3 million which is cheaper than offshore drilling. According to Coherent Market Insights study, North America accounted for the highest market share, in terms of revenue, in global drilling waste management market in 2016. This is mainly due to increasing E&P activities created by shale gas. Due to exploration of shale gas, there is an increase in the usage of horizontal drilling and hydraulic fracturing techniques. The manufacturers of oil, natural gas, and shale gas are focusing on exploration, production, and development in New Brunswick. This projects are registered into Environmental Investment Assessment (EIA) review. Europe accounted for the second largest market share in drilling waste management market, followed by Africa. 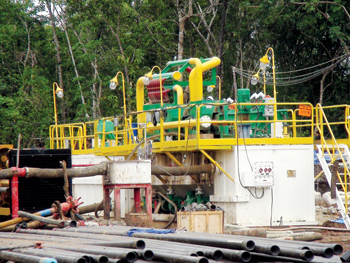 The burgeoning growth in North Sea, rising offshore exploration, and production activities in Nigeria have further augmented the drilling waste management market in the region. In 2016, ExxonMobil along with its partners announced the discovery of oil in the Owowo-2 and Owowo-3 fields of Nigeria’s shores. The discovery is estimated to be between 500 million to 1 billion barrels of crude oil. An estimation of around 85 trillion cubic feet of gas was discovered in the Rovuma basin in Mozambique, which has fueled the growth of the offshore drilling rigs in Africa. Asia Pacific has witnessed a significant growth in global drilling waste management market, owing to stringent government regulations and increasing activities for unconventional sources. In India, the oil and natural gas corporation (ONGC) announced its project of drilling 22 exploratory wells located at Ahmedabad and Gandhinagar, districts of Gujarat, in 2016. The increasing demand for the reduction of environmental impact of operations globally, manufacturers continue to develop facilities and manage waste streams produced by operations. The key players operating in the global drilling waste management market include Halliburton Co, Weatherford International, National Oilwell Varco, Xi’an Kosun Machinery Co, Tervita Corporation, TWMA, Step Oiltools, Soli-Bond, Specialty Drilling Fluids Ltd, Soiltech as, Scomi Group BHD, Secure Energy Services, Schlumberger, Nuverra Environmental Solutions, Ridgeline Canada, Newalta, Hebei, Solids Control Co, Imdex Limited, Baker Hughes, Derrick Equipment Company, and Augean.